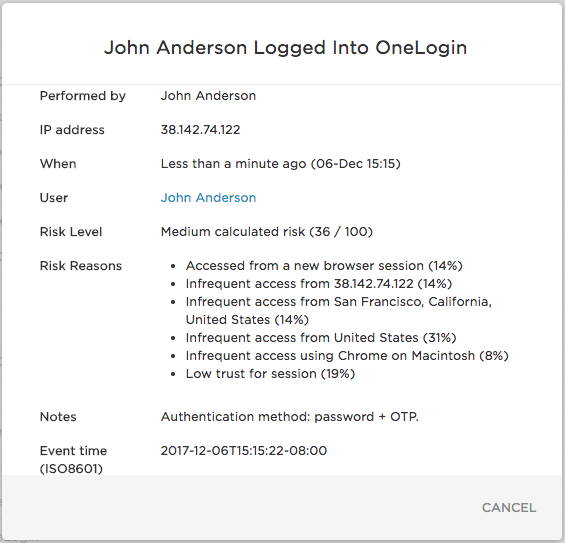 The events log monitors all the actions that occur within your organization's OneLogin account. From individual user actions, to administrative operations, provisioning, and MFA device registration, everything that happens within an organization's OneLogin account is tracked here. To view the Events page, proceed to Activity > Events where you'll see a list of all action events, see the screenshot below. Users can quickly sort the complete list of events by application, events, users, and risk scores into various permutations using 4 different filters. For instance, you can filter events to select a specific user's logins that resulted in low risk scores and easily view the score in the Risk Score column. The Risk Score filter enables you to sort events by risk scores. An additional column has been added to increase the visibility of each Risk Score event. High Risk events, with a score over 51, are marked in red for easy identification. If you are not on the Adaptive Plan, the Risk Filters are present but filtering by Risk Level will return an empty list. In the screenshot below, you see the Risk Level filter to the right with 5 facets to choose from. Any Risk Score - Returns any event. No Risk - Returns any events that have been scored No Risk (0 - 4). Low Risk -Returns any events that have been scored Low Risk (5 - 25). Medium calculated risk -Returns any events that have been scored Medium Risk (26 - 50). High Risk - Returns any events that have been scored High Risk (51 - 100). These events are marked in red, see the screenshot below. Click on any event to view specific information such as the user, IP address, time of the event, the risk level score, risk reasons, authentication method, and additional fields, depending on the type of event. Risk reason represents the relative percentage a particular reason contributed to the overall risk score.